In Google's search bar you may have seen many news, companies or websites coming to the top. If you are searching for information from any keywords in Google, you may see many options. Companies come in a variety of ways to come up top in Google rankings, but still they do not get results. 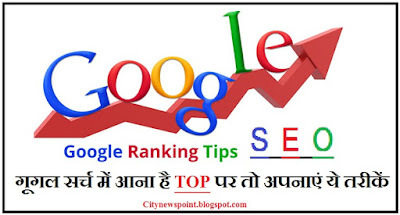 Let us know that Google Ranking Process is called algorithm, with the help of which Google brings a news website to the first page of the page. So if you want to come to the top of Google search, then here we are giving you some specific information related to it. Google recently made some changes to its algorithm process. Under this, Google shows the same news, websites or things at the top, which has been the most read or searched. That is, the more people who have seen or shared your news will be above the same number of racking. In addition to its things, you have to take care of some things so that your content can come up in the rankings. As we have already mentioned, Google places the same content in the first ranking which will be the most searched. In the same way Google determines your ranking based on the clicks your website or website has received. That is, the more clicks your content receives, the more you will be on top of Google rankings. The same, when a website's click is low, it reaches the second or third page of the Google page. If your bounce rate is high under Google's new algorithm, your ranking decreases. Explain that having a higher bounce rate in your content means that users are not happy with the information given by you or that they are not readable. This reduces the chances of coming to your first page. How long the users have lived on your content, it also matters to Google ranking. Based on how long the user will click on your content, Google decides your ranking. What kind of users access to Google through your content, it also matters in the ranking. If users reach your content via social media, direct or Google search, then Google takes your ranking up. At the same time, if your traffic source is low then your website can be the most in the back of Google search. 0 Response to "How gat on Top Google Search"